When the biggest name in Chinese pork is poised to buy the biggest name in American pork, it’s tempting to speculate what the purchase will bring. Shuanghui International hopes its $4.7 billion acquisition of Virginia-based Smithfield Foods will bring legitimacy. Shuanghui is China’s leading pork producer, but recent scandals have tarnished the name. In 2011, hundreds fell ill from Shuanghui pork tainted with a banned growth-enhancing chemical. The national pork industry took another earlier this year when more than 16,000 dead pigs were found floating in the Huangpo River and its tributaries. China is the largest consumer of pork worldwide, and the Smithfield purchase not only promises more meat, but also helps win back some consumer confidence. 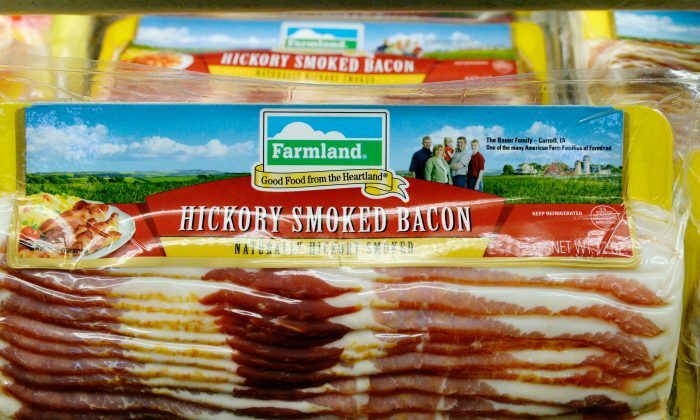 Smithfield owns more pigs than the next eight largest hog producers combined; and thanks to two decades of strategic mergers, the company roster now includes brands such as Eckrich, Farmland, Armour, and other famous names in American pork. Shareholders on both sides unanimously applaud the purchase, and say it will benefit everyone, promising factory farming upgrades for Chinese producers, and a booming market for U.S. farmers. “It will be business as usual–only better,” said Smithfield president and CEO, C. Larry Pope in a May 29 statement. Related discussion: What is the cause for high youth unemployment in the United States? From a trade perspective, this sale is unprecedented. It represents the largest Chinese purchase of an American food and beverage company by far, and differs distinctly from the other resource purchases Chinese investors have made in the past. Instead of securing metals, minerals, or other raw materials for product manufacturing back home, this time China is buying a significant portion of the American food system. Smithfield, however, comes with its own issues. The industry behemoth is already blamed for being too big—it owns over a quarter of U.S. pork processing and 15 percent of hog production. Critics say that Smithfield’s rise in size should have been investigated as an anti-trust violation long ago. Now, with so much U.S. pork power suddenly thrust into foreign hands, some are calling to hold back on the deal, and allow more time to reflect how it will affect the market. According to Patty Lovera, assistant director of Food & Water Watch, there are several concerns related to the Smithfield deal, and one of the most immediate is environmental. Smithfield already has a long record of pollution violations related to the enormous manure lagoons that result from its high-volume hog farming. Critics say a sudden production increase designed to satisfy a hungry Chinese market could hurt U.S. farming communities even more. Another concern is Chinese pork imports. While Shuanghui’s purchase price is over 30 percent more than the stock’s market value, if rules change and the company is able to systematically establish the Smithfield model back home, China may soon be shipping its pork back to the states.